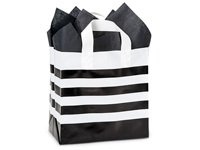 Rose 5 x 3 x 8" Cub 8 x 4 x 10" Hobo 10 x 6 x 10" Vogue 16 x 5 x 12" Queen 16 x 6 x 16"
Rose sized Black Stripe plastic gift bags are made from 4 mil white plastic. Bags measure 5x3x8" and are bulk packed in cartons of 100. 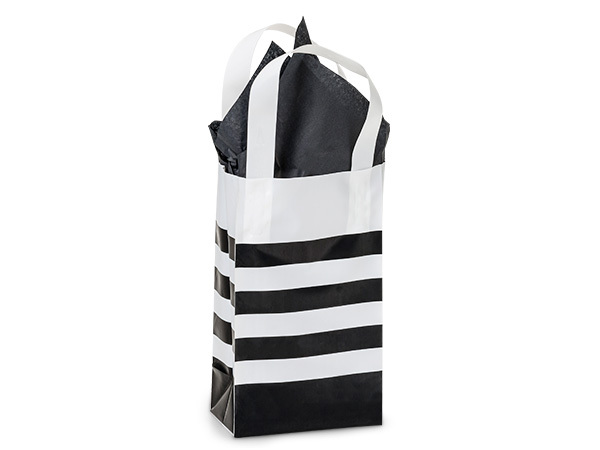 Striped Black and Gold bags are 4 mil HDPE with 6 mil soft loop handles and cardboard inserts for rigidity and strength. Heavy duty material protects items from weather and leakage. 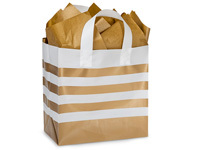 Strong reusable bags are perfect for gift giving. Classic stripes make this bag a great year round and perfect for Christmas, Valentine's Day and weddings!